Figure 1. Damage from white mold in a soybean field under irrigation. Many early planted soybeans in Wisconsin are nearing the R1 (beginning flower) growth stage. This means that soybean growers should consider their in-season white mold management plan and if they are going to implement it. 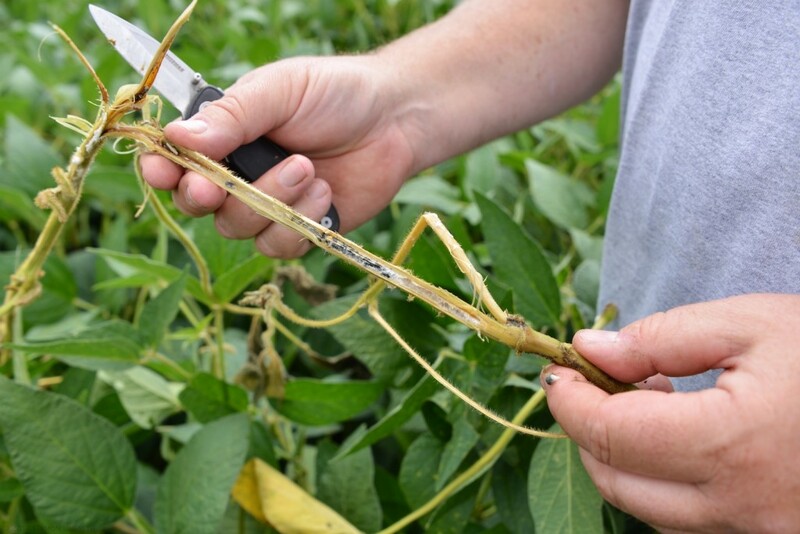 Research has shown that this is the best time to apply fungicides for control of this lethal soybean disease, if conditions are conducive for infection. Before we consider the in-season control options, lets review some basic information from our white mold (Sclerotinia stem rot or SSR) fact sheet. You can also download a PDF version of the fact sheet by CLICKING HERE. What is Sclerotinia stem rot? Sclerotinia stem rot (SSR), also known as white mold, is a serious and often lethal fungal disease that affects a wide range of agricultural crops in the U.S. including many broadleaf vegetable crops (e.g., carrots, cruciferous plants, peas, potatoes, snap beans) and field crops, especially soybean. SSR is most severe on soybeans in high-yielding environments that have dense, fast-growing canopies (Fig. 1). Figure 2. Sclerotia of the white mold fungus inside a soybean stem. What does Sclerotinia stem rot look like? 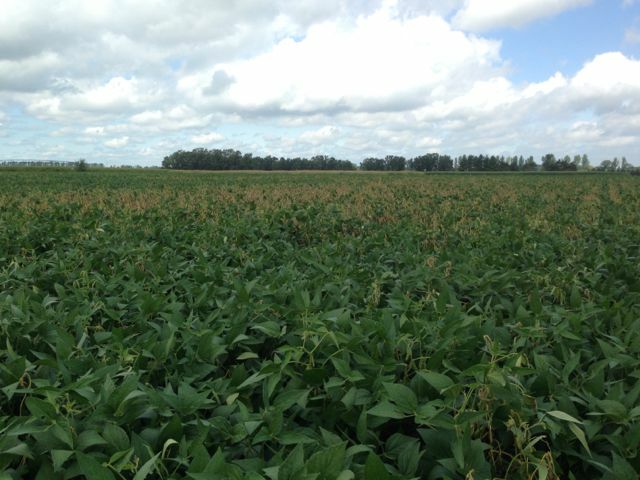 SSR causes sudden wilting of soybean leaves and rapid plant death. Lower stems of affected plants become bleached and under moist conditions (e.g., high humidity, frequent rain), become covered with a cottony white fungal growth. Small, black structures that look like rat or mouse droppings (called sclerotia) form on and inside the stems and pods of affected plants (Fig. 2). Where does Sclerotinia stem rot come from? Sclerotinia stem rot is caused by the fungus Sclerotinia sclerotiorum which survives as sclerotia in dead plant tissue. Sclerotia can survive for five years or more in soil. A cool, moist environment favors Sclerotinia stem rot development. Under these conditions, sclerotia germinate to produce small, mushroom-like structures (called apothecia) that produce spores. These spores can be spread by wind, insects, or rain splash. In soybeans, most infections occur via open or senescing (i.e., withering) flowers. Occasionally, the fungus will spread from plant-to-plant via direct contact of roots or other plant parts. How can I save plants with Sclerotinia stem rot? SSR is difficult to control once the disease has occurred. If affected plants are limited to a small area in a field, removal and destruction of plants may help to limit production of sclerotia that can further contaminate and cause long-term problems in the field; however, this strategy usually is not feasible on a large scale. If affected plants are removed, they should be burned. DO NOT compost plants or till them into the soil. How can I avoid problems with Sclerotinia stem rot in the future? To prevent introduction of the SSR fungus into soybean fields, be sure to plant sclerotia-free soybean seed. Also, harvest fields with SSR last to avoid spreading sclerotia of the SSR fungus from field to field on combines. In fields with a history of SSR, grow soybean cultivars that have been bred for SSR resistance. This is the most economical and successful long-term strategy for SSR control. In addition, consider using no-till production for three to four years as this will reduce the number of viable sclerotia near the soil surface. Rotate soybeans with small grain crops that are not susceptible to SSR (e.g., wheat, barley, oats) to further reduce the number of viable sclerotia in the soil. Increase row spacing and reduce soybean seeding rates to promote a more open canopy that will have better air circulation and thus dry more rapidly. Also, make sure fields are well drained and avoid excessive irrigation especially during flowering. Remember that the SSR fungus prefers wetter conditions; under drier conditions the fungus is less likely to infect. Maintain good broadleaf weed control. Weeds not only decrease air circulation and promote wetter conditions, but can also be hosts for the SSR fungus. Finally, there are fungicides and biological control products available for SSR management. Several biocontrol agents (the most effective being one that contains a fungus called Coniothyrium minitans) have been shown to be effective in controlling SSR. What are my In-Season Control Options? Fungicides containing an active ingredient that is a succinate dehydrogenase inhibitor (SDHI), such as boscalid, are often effective in SSR control. The active ingredient picoxystrobin (a type of strobilurin fungicide) has also been shown to be effective in SSR control in university research trials. Applications rates are very important for these products. Research in Wisconsin and surrounding states has indicated that Endura (active ingredient is boscalid) should be applied at the 8 oz/acre rate while Aproach (active ingredient is picoxystrobin) should be applied at the 9 fl oz/acre rate. Timing of fungicide applications is critical. Fungicides should be applied during early flowering (R1) to early pod development (R3) growth stages. Research has shown that Endura is best used when applied in a single application at R1. Aproach should be applied twice with the first application at R1, while the second application should be applied at the R3 growth stage with both applications at the rate indicated above. Fungicide applications made at the full pod (R4) growth stage or later will NOT be effective. In addition, applying fungicide treatments after symptoms are visible will not be effective. In 2014, we conducted a trial using both Endura and Aproach fungicides applied at the R5 growth stage. Details of the trial can be found by CLICKING HERE and scrolling down to page 12. Prior to fungicide application we rated the plots for disease using the SSR disease severity index or DSI. We then rated the plots again 2 weeks later at the R6 growth stage to see if the disease progression slowed. We also harvested plots to determine yield. Initial DSI levels were fairly high, but uniform among all plots (Table 1). DSI ratings at R6 revealed that neither fungicide slowed the disease or reduced the levels of disease compared to the non-treated controls. Yield for all treatments was around 40 bu/acre for all treatments, and was not statistically significant. These results indicate that even the best fungicide products won’t work well on white mold if they are applied at the wrong time. These products have increased yield substantially in research trials where white mold pressure was high, when they were applied at the correct growth stage. In 2013, both programs were among the best in a trial located at the Arlington Agricultural Research Station. Results of that trial can be viewed by clicking here at scrolling down to pages 6 and 7. Timing and preventative application are very important if you choose to use fungicides to control white mold. Finally, be sure to read and follow all label instructions of the fungicide/biological control product(s) that you select to ensure that you use the materials in the safest and most effective manner possible. Table 1. Sclerotinia stem rot severity and yield after applications of Endura and Aproach fungicides at R5. If you would like to learn more about white mold, you can click here to download a PDF copy of a newly revised fact sheet developed by extension soybean pathologists in the North Central region. You can also get more information about white mold by clicking here to watch a short video.